Perth - South Africa will give all-rounder Jacques Kallis until the last moment to prove his fitness for the crucial third and final Test against Australia starting on Friday at the WACA Ground. The 37-year-old had appeared certain to miss the series decider, which will also determine which of the two teams ends up with the number one ranking in Test cricket. After suffering a hamstring injury during the second Test in Adelaide and unable to bowl in Australia's second innings, Kallis nonetheless played a crucial role in saving the match, which finished on Monday. He scored 58 and 46 despite batting down the order, without the aid of a runner and being unable to sprint between the wickets. He had reached his 44th Test century with a brilliant 147 in Brisbane. Proteas captain Graeme Smith said seamer Vernon Philander would return after being a late withdrawal in Adelaide due to back stiffness and he voiced hope that Kallis would also be fit despite the short break. "It is moving into a positive light," he said of both players. "I think Vernon is ready to go and Jacques is coming along nicely. 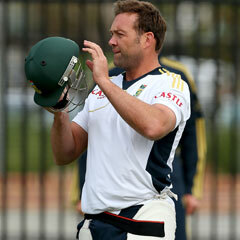 But we will wait to see how he (Kallis) comes through on Thursday and Friday morning. "To have him at number four for us brings a lot of batting strength for us and is crucial. Hopefully, when we wake up on Friday morning he will be ready to go but we won't be making that decision lightly." Smith said Kallis would bat at four if he played, although he would not be able to bowl. Spinner Imran Tahir looks likely to be dropped after returning horror figures of 0-260 in Adelaide. While Australia are considering a four-pronged pace attack, Smith said the Proteas wanted a spinner in their team, hinting that Robin Peterson was in line to replace Tahir and play his seventh Test. "I think that we would go with a spinner," the captain said. "Robin has come into contention, Imran hasn't performed that well and his confidence is low." Smith said the Proteas would focus on curbing the prolific run-scoring of Australian captain Michael Clarke and the veteran Mike Hussey. The tourists are aware the Australians will use Ricky Ponting's last Test match as motivation to try and win the series but Smith said there was a mood of "calmness and clarity" in his camp. He said the misfiring South African attack had taken confidence from their improved effort in the second innings in Adelaide, where they dismissed Australia for 267. "Australia have played really well in the series and we haven't been at our best, but we are still here," he said. That is what we take out of the first two Test matches."